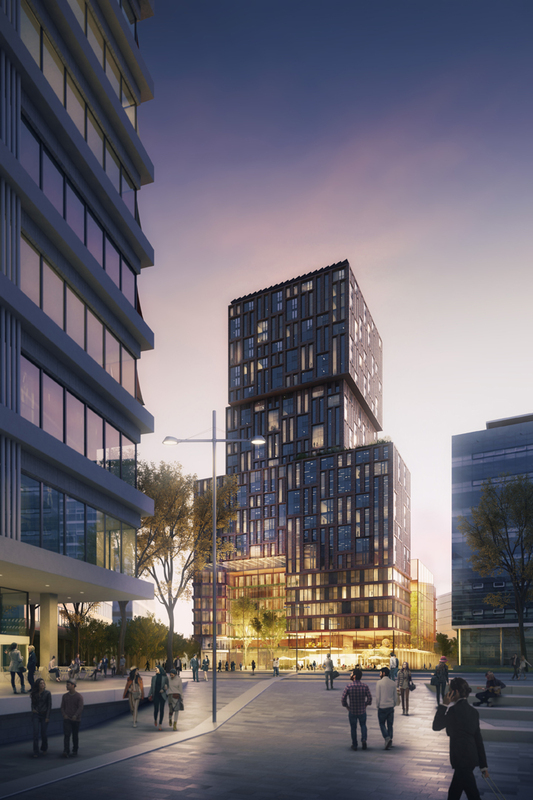 Galaxy Tower is a hotel and residential tower in Utrecht. The tower has an open structure with (roof) gardens and a striking ceramic façade. The 4-star Amrâth Galaxy Jaarbeurs Hotel will be located on the first floors of this 90-meter high tower. The hotel will get 250 rooms, a restaurant, swimming pool and a wellness area. The 300 apartments are situated on the top floors of the tower. Hotel and apartments will benefit from each other’s presence. Many hotel facilities will also be available to residents. The area near the central station of Utrecht is getting a huge makeover. An area transformation is underway at more than 35 locations. The aim is to transform this location into a mixed neighborhood where people can live, work and relax. With parks and lots of green places. The location Jaarbeursplein is important for the development of Utrecht towards this west side of the city. Galaxy Tower is one of the first developments there. With a mixed program, the tower has an important function for the new residential area being developed in the neighborhood and the business area on the other side. Galaxy also has to fulfill a dual role visually. It is a metropolitan building with a scale that can hook up with the new residential area. To achieve this, the tower has stacked building volumes of different sizes. It has lots of green spaces and is attractive from all sides. It creates a high quality all around. Thanks to the solar panels integrated in the façade, the energy consumption of the tower will be spectacularly low. The building also meets the new sustainability requirements of the municipality of Utrecht.